Today at homify, we are going to look at 7 ideas to make the most of space in small bedrooms. Why? Because small rooms don't have to be less attractive than their larger rivals! On the contrary, often it's the small dimensions that make the space more intimate and more private. Even the smallest of bedrooms can be the most ideal refuge after a hard day at work! The bedroom should be a resting place. It's the one space in the home that experts recommend should be devoid of televisions, computers and electronic items. So if possible, it's best to reduce this room to the most functional and necessary, including a comfortable bed and a storage space for clothes. Minimalism can be key to a peaceful and serene personal space. The purpose of this article today is to learn how to apply solutions to the lack of space. We will learn from some talented interior designers and decorators, seeing for ourselves how we can make the most of every square inch of a small bedroom. 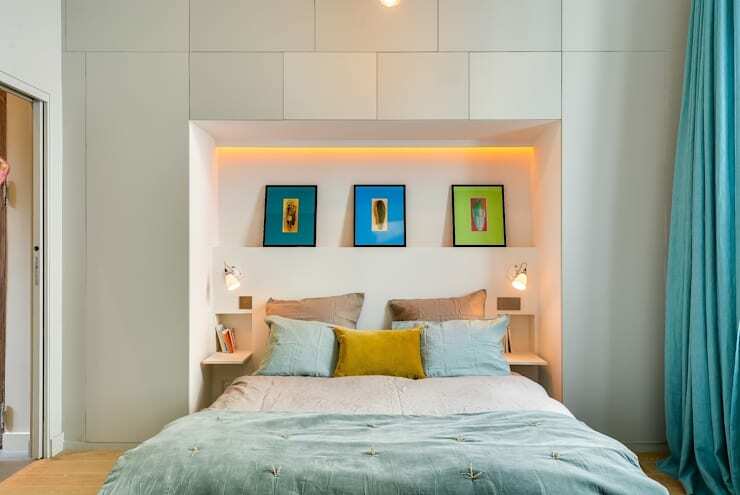 In this design by Meero, we can see how the space between the bed and the walls does not feature bedside tables but rather small niches with cabinets. This small room can thus afford to feature a large bed. It also has plenty of storage space, keeping items stored neatly out of sight. This is a great way to combine good taste with functionality. An ingenious solution is to opt for flexibility, which allows you to turn your bedroom into a multi-functional space. This bed, for example, can be perfectly hidden by folding up into the wall. It will blend into the walls that surround it. This allows this room to be used for other functions when the resident isn't sleeping. Have a look at these 18 multi-functional furniture ideas perfect for small houses for more inspiration! Another great solution for a tiny room is to opt for a sofa bed. As long as you have a comfortable mattress, this can be a wonderful option. This allows us to create a small living room in the day and a comfortable bedroom in the night, all out of the same space. With a little bit of art, we can make this room trendy and stylish too! Combining a bed with storage space is always recommended. You can mix both functions all in the same space. A sleeping space working in harmony with a cabinet or closet is all that you need for a savvy and modern bedroom. In this design, we can see how the bed is elevated above the closet, while a little library shelf runs along the wall. 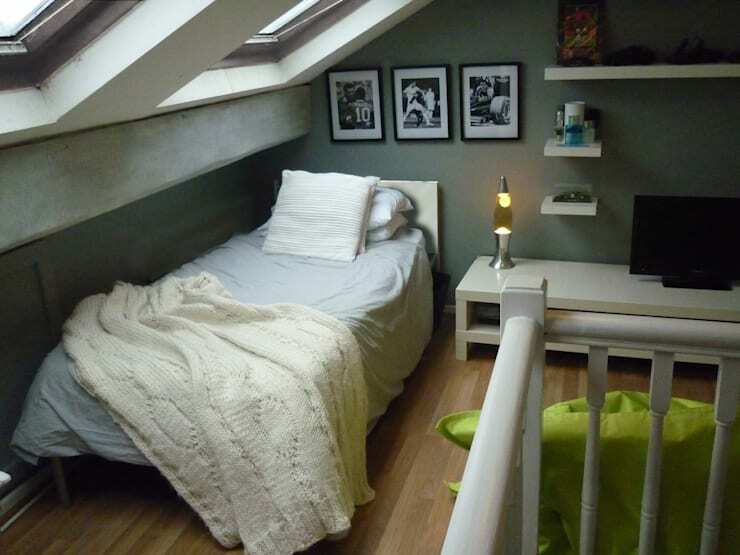 A single bed against the wall is sometimes the only possible solution in smaller rooms. In this bedroom, we can see that despite the lack of space, the room holds a lot of charm. The designers have installed skylights in the ceiling, allowing for sunlight to stream in during the day as well as views of the moon and the stars from the bed at night. Thanks to the layout of the bed, a fairly long cabinet and shelves also fit into the space. This bed with drawers is a practical solution for two reasons. It allows for extra storage space and makes the absolute most of the space under the bed all at the same time. This bed makes the most of vertical space – another wonderful solution for a small bedroom or even a studio apartment. The free space underneath the bed allows for other furniture to be incorporated into the space such as a desk and chair or a sofa. Of course this type of bed works well in room with high ceilings!